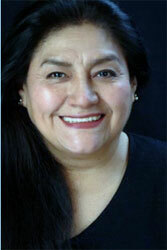 Veteran actor Teresa Yenque has been selected as this year’s recipient of the Trailblazers Award at the 2012 Reel Rasquache Art & Film Festival. This award, to be presented to Yenque at a gala ceremony on Sunday May 20, honors distinguished members of the entertainment industry who have paved the way for others through their career accomplishments. Past recipients include Wilmer Valderrama, Ligiah Villalobos, and Gabriela Tagliavini. Fellow honorees at this year’s ceremony will be Director Chris Weitz (Pioneer Award) and Artist Patricia Krebs (Vision Award). Yenque is a fitting award recipient, as she has blazed trails as an actor for the past four decades. After immigrating from Peru, she began her stage career with the Repertorio Español of New York in the 1970’s, and has amassed an impressive array of film and television credits, while always maintaining her New York stage presence. Yenque appears often on popular programs such as 30 Rock, Law & Order: SVU, The Sopranos, Prime Suspect, and daytime series such as One life to live and All My Children. She was a pioneer of the first Spanish-language TV series taped in the USA, Angelica, Mi Vida (1988). Her frequent appearances as maids in different episodes of Law & Order: SVU prompted one entertainment journalist to ask if she is the only living maid in New York City! Yet her pivotal roles in feature films, shorts, and television attest to her versatility and perseverance in the industry. She has worked opposite Al Pacino, Salma Hayek, Alec Baldwin, Natasha Richardson, and many others. On the stage, following her 1974 Repertorio debut in La Celestina, she has continued to turn in memorable performances in plays such as Blood Wedding, Antigona Perez, and Bad Blood, and can currently be seen in The House of Bernarda Alba and Chronicles of a Death Foretold. She has performed on Broadway, at Lincoln Center, and in theatres throughout the New York area, as well as at DC’s Kennedy Center, and other national and international tours. Her long list of theatrical awards includes ACE, Palmas de Oro, and a Citation of Honor from the President of the Borough of Queens. In 2011, the Hispanic Organization of Latino Actors (HOLA) gave her a Special Recognition Award for her 40 years of excellence in the entertainment industry, and in 2012 she was the recipient of ACE’s “Premio Extraordinario” for both her career accomplishments and for her valued contributions to the Latino theatre movement in New York City.